NCBIO works with a number of organizations on federal policy issues and activities. 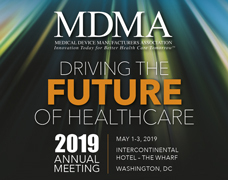 The Advanced Medical Technology Association (AdvaMed), is a trade association that leads the effort to advance medical technology in order to achieve healthier lives and healthier economies around the world. The Association acts as the common voice for companies producing medical devices, diagnostic products and health information systems. The Council of State Bioscience Associations (CSBA) is a confederation of state-based, non-profit trade organizations each governed by its own board of directors. The common mission of the members of the CSBA is to promote public understanding, and to advocate for public policies that support the responsible development of the bioscience industry. MDMA is a leading voice representing the interests of innovative and entrepreneurial medical technology companies. MDMA members all share a common goal: to provide patients and clinicians with timely access to safe and effective medical technologies that improve the quality of life. PhRMA, the Pharmaceutical Research and Manufacturers of America, represents the country’s leading biopharmaceutical researchers and biotechnology companies. Members are committed to finding tomorrow’s cures and treatments for some of the most serious diseases such as Cancer, Alzheimer’s Disease, Cystic Fibrosis and Parkinson’s. http://phrma.org The organization releases periodic reports including information on clinical trials in North Carolina. We Work For Health is a grassroots initiative that shows how biopharmaceutical research and medical innovation work together to create a strong, vibrant economy and a healthier America. It unites biopharmaceutical companies with business and community partners to raise awareness about the vital role we all play in delivering life-saving and life-enhancing advancements in medicine, while educating elected leaders on the impact that public policies have on companies’ ability to continue to innovate.